The Fund returned +1.76% net of fees for the month of March 2019, outperforming the ASX 100 for the March 2019 quarter by +1.12%. The portfolio’s largest positive contributions for the month came from a long position in Fortescue Metals Group and short positions in AMP Ltd and IOOF Holdings Ltd while largest detractors were long positions in Commonwealth Bank of Australia and ANZ Bank and a short position in Harvey Norman. The Fund had 33 long positions and 20 short positions with largest exposure to medical devices & services and technology stocks. There was less exposure in the major banks and income stocks. 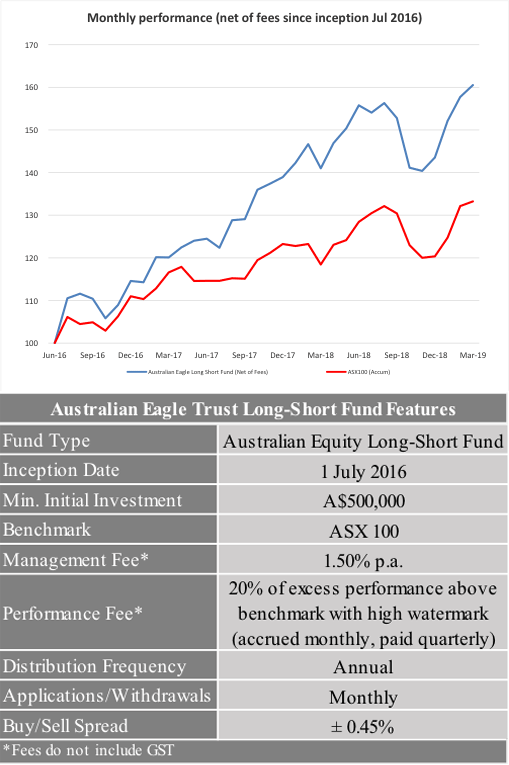 Established in July 2016, the Australian Eagle Trust Long-Short Fund aims to achieve strong double digit returns by allowing clients to access Australian Eagle’s demonstrated historical strength in constructing Australian share portfolios applied to a long-short product. Modelling a combination of Australian Eagle’s actual long investment performance since 2005 in conjunction with a short selling discipline, suggests that this product can provide strong investment returns along with an alpha performance that is negatively correlated to the broader Australian equity market. Australian Eagle’s investment process seeks to deliver significant outperformance by identifying mispriced stocks with changing growth profiles and building concentrated portfolios of those stocks.